For more photos click here. For the main page of the blog click here. Although I still have a lot to do to get my Craft Room “up to snuff” (a constant ongoing process I might add), I thought your Bloggers may benefit from this idea for storing small paints (or anything else their heart desires). Floor and counter space is more important to me than wall space, so I wanted to come up with some sort of wall storage component that was relatively inexpensive, minimum in size, and easy to install. While shopping at Target, I noticed they had these cutlery trays on sale (50% off). 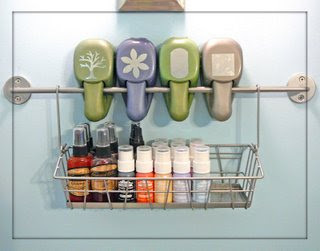 For about $5 each, I thought they would work perfect to hang on the wall to store my small jars of paint; not to mention the fact that they already had a million holes on the bottom of the tray which would make nailing them to the wall a breeze! Initially, I purchased the cutlery trays that had multiple silverware compartments, but after bringing them home, I discovered the compartments (shelves) were not tall enough to hold my paints, so I opted for the single drawer style instead and stacked the paints one on top of the other. I actually ended up keeping the other trays and plan to hang them up to use for embossing powders! 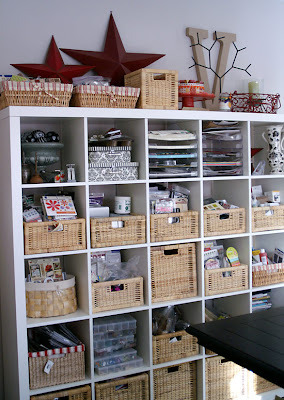 This system works great for me because everything is in plain view, yet not eating up my counter/floor space – no more having to open and close every 12x12 plastic drawer using my old storage system to find just the right color. 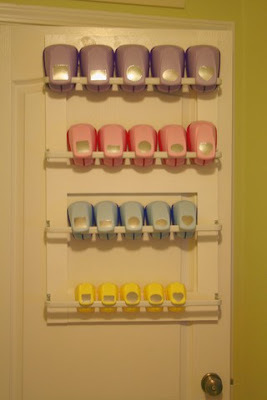 I keep a small step stool in my Craft Room, so reaching the paints on the wall isn’t a problem. I bought all of the available trays at my local Target and even had my mom buy the last one at her store. I still have more paint and waiting for more of these trays to be for sale (hopefully they will)! If not, I’ll just have to conjure up some other “idea”. You can read more about Keesha here. 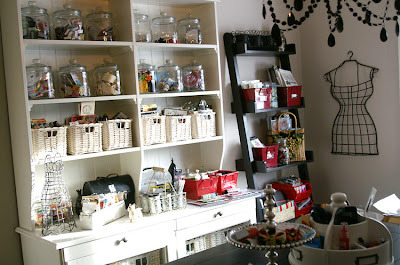 You can see more photos of Julie's studio and explanations here. Using a hanging file box yesterday from Target. For more ideas click here. 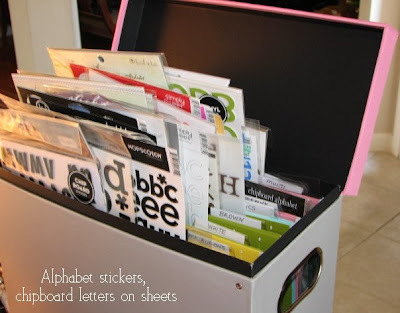 This is a fab idea for storing foam stamps using self adhesive velcro. You can see more of her ideas here. Since I saw the advert for the Cropper Hopper vertical drawers I thought they were a great idea and great for my crafting ways. I have the three types (one 12 x12 ", two 6 x 12" drawers, and three 4 x 12" drawers) and the I use them for several things, but the one with three drawers is perfect for the Ranger dabbers. In total, they fit 33 dabbers. I found this link in the latest issue of Creating Keepsakes, in the little adverts section (yes, I do look there with attention!) 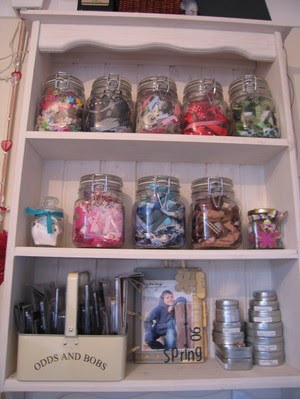 is the perfected version of my idea for ribbon storage. You can buy it here. 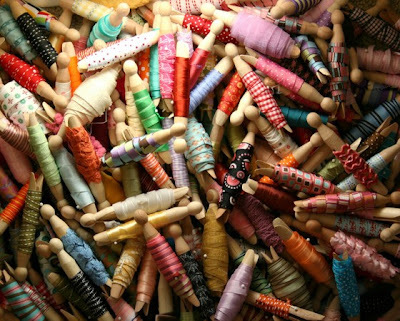 Taylor VanBruggen posted a very good entry on her blog about her studio. Visit her blog for more photos and very nice card ideas.